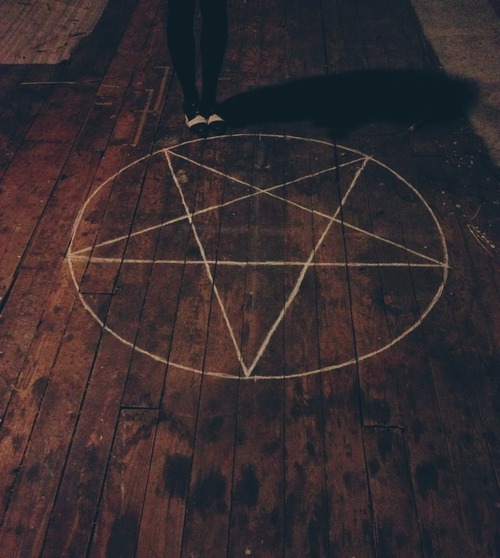 They each sat at a point on the chalky pentagram drawn on the creaky wooden floorboards up in the attic. They thought that they were about to summon a ghost, but little did they know, I was already there. They positioned six white candles in front of them, with one flickering for attention in the center. Around the room, strange religious books and objects were scattered, and varying colours and sizes of candles cast eerie shadows that looked almost ghostlier than I. Penta wafted incense around the room and hung several Crucifixes before reaching into an antique-looking trunk dusted under the window. “Penta, how experienced exactly are you?” Aidan asked, shrugging off his doubtful question with a cheeky chuckle. “Well ” Penta started before being interrupted by Gina, glasses slipping off her eyes. ‘Gee, that’s reassuring!’ thought Aidan, passing off his fear as a smile to his friends. What were her parents thinking? She’s the kind of girl ghosts like me are allured to, except, I had spent most of my afterlife up in this attic. Penta heaved the book open in her lap.She flicked furiously through the fragile pages, skimming through each page, trying to remember what page the correct ritual was on. She was completely prepared for the ritual, but had forgotten to prepare the most important part. Luckily, Gina had noted the page on her clipboard. She laughed and fixated on Raymona, who conspicuously raised her eyebrow at the group. “Do you seriously believe any of this is real? You are all so childish.” Raymona expressed. “Yes, thanks for coming Raymona. You really are contributing to the ritual.” menaced Aidan, leaning to plant a kiss on Raymona’s forehead. Gina announced the time. It was 11:59. Penta held a candle up to the book and began to read words that couldn’t exactly be considered words, and everyone joined hands. She read, rolling her ‘r’ sounds and ‘l’ sounds. The chirp of Aidan’s mobile notification disrupted the ritual. He gestured a sorry with his hands and asked Penta to proceed, but Jason and Gina disrupted yet again to assure that their phones were on silent, too. I decided it was about time to make my first move. I floated towards the round window over-looking the street, it’s only company being the leaves dancing in the wind. Penta commenced reading, as Gina checked the ‘begin ritual at midnight’ box on her checklist. I lifted the golden latch on the window and allowed the wind to gust through the attic, blowing out some of the candles in the room, like an eager child blowing out candles on a cake. Aidan shrieked and jumped into the security of Raymona’s lap. Boy, would it be hard to justify against fear with that one. The group came up with rational explanations as to how the latch on the window suddenly opened while Penta re-lit all the candles. I was disappointed in Jason. He’s been the object of my haunting for years how has he not recognised me? Great twist! You have a very engaging style. Well done.